Given a warm welcome by Conergy. 1 m assive solar strategies are a great way to reduce the energy used for heating, Ks cooling, and lighting in a house after it is built, but what about the energy that J goes into a home's construction? Many passive solar homes are constructed with materials like steel, concrete, and fiberglass insulation, which all have high embodied energy. And besides using a lot of energy in their manufacture and transport, many of these products have detrimental environmental and health effects. If you want to build a home that saves energy at every stage (and is more healthy to boot), natural materials such as earth and straw, with their lower embodied energy, offer an alternative to conventional, manufactured materials. "Insulation" refers to a material's resistance to the passage of heat. Small pockets of trapped air or gas, or even a vacuum in a material provide this resistance. In general, the lighter a material is, the better its insulation value. Natural insulating materials include sawdust, wood shavings, feathers, leaves, bark, straw, and moss. Any natural insulation material can be used to fill a cavity, such as between your ceiling and roof. However, some materials settle over time, which reduces their insulation effectiveness. When you're choosing insulation, consider this, as well as a material's fire safety. Commercially available natural insulation products include cellulose, rock wool, cotton batts, and sheep's wool. Cellulose insulation is made from shredded newspapers, treated with a fire retardant, and is blown into wall and ceiling cavities either wet or dry. Rock wool is made of spun fibers from basalt or limestone. It is available in both batt and board form, and is extremely fire resistant. 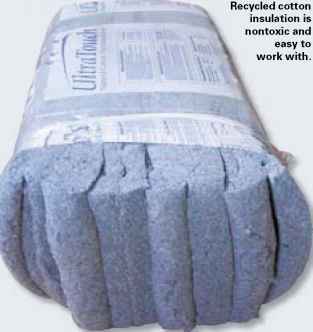 Cotton batt insulation, fabricated from denim mill scraps, has an insulation value (also known as R-value) per inch similar to fiberglass, but is safer to handle and much more pleasant to install. Sheep's wool is naturally flame-resistant and insulates even when it's wet. Woolen batts have been manufactured and used in New Zealand for more than a decade, and are now available in Canada and through some U.S. distributors. Lightweight volcanic rock, filled with little bubbles, is called pumice or scoria. Although it has a lower R-value per inch than the other natural insulations, pumice is one of the only ones that can be used in damp conditions or in direct contact with the earth, because it will not rot. It also can be mixed into concrete, lime, or earthen walls to improve their insulation values, and is often used to insulate underneath earthen floors. Because high levels of attic and roof insulation are crucial to a home's energy efficiency, and because insulation usually needs to be as lightweight as possible for structural and safety reasons, buying a commercial nontoxic insulation for your roof may be the most sensible option. 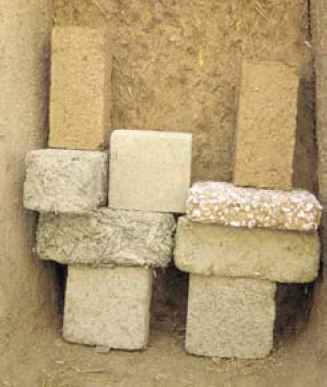 This sample of "light clay" blocks showcases the various materials that can be used, such as straw, sawdust, wood chips, paper fiber, and perlite. The fibrous bark of redwood and cedar trees can be shredded to make excellent, fire-resistant insulation. Natural materials offer more creative alternatives where walls are concerned. One of the most versatile is straw bale. Bales can be stacked up like bricks, may be load bearing or serve as infill within a post-and-beam structure, and offer R-values of 27 or more. "Straw light-clay," also called "light straw-clay" or "slipstraw," is made by coating loose straw in clay slip (clay dissolved in water) and then tamping the mixture into a form, which is later removed. It is a nonstructural infill that can be used in combination with post-and-beam building or even conventional stud-frame construction. The lightest mixes contain so little clay that their densities are similar to straw bale, which gives them a similar R-value per inch of thickness (see the sidebar on the next page). You can also make light-clay mixtures with wood chips, hemp hurds (from the plant's woody core), or pumice. If the framing for a light-clay wall is constructed like a standard stud frame, it will suffer some of the same thermal disadvantages. At about R-1 per inch of thickness, wood is only a moderate insulator, and studs act as "thermal bridges," transferring heat through the home's wall, and reducing the wall's overall insulation value. Staggering small framing members, such as 2 by 4s or even 2 by 2s, so that the light-clay infill makes up most of the wall thickness at any point (except around windows and doors) minimizes thermal bridging. Likewise, in post-and-beam applications of straw bale, better insulation results if a continuous bale wall is "wrapped" around the posts—rather than stacking the bales in sections between the posts. The building industry uses "R-value" to refer to a material's insulation value. In theory, the higher the R-value, the better the material is at resisting heat flow. Finding consistent, reliable R-value data for natural materials can be difficult. This is partly because little money can be made by testing and promoting inexpensive, abundant, and readily available materials like earth and straw. Also, natural materials are much more variable than industrial materials. And even variations in building techniques can affect the properties of a natural material. An extreme example of this is straw light-clay. The density of the resulting material varies enormously, depending on the amount of slip used, the thickness of the slip, and the force used when tamping. Reported densities for straw light-clay range from 1,200 to 300 kilograms per cubic meter, which corresponds to a range of R-values between 0.1 to 1.4 per inch. were probably the result of improper construction detailing. For example, if the spaces between bales are not carefully stuffed, and if plaster is not bonded to both sides of the wall, a lot of heat can be lost through the gaps. A conservative R-value estimate for plastered straw bale walls is R-1.5 per inch of thickness. Using this value gives a wall made of three-string bales stacked flat (22 inches; 56 cm of straw, plus 2 inches; 5 cm of plaster) an R-value of 36. A comparable wall of two-string bales would have an R-value of 27. A similar range exists in the published R-values for earthen materials, such as adobe. In a series of tests conducted by ASHRAE (American Society of Heating, Refrigerating, and Air Conditioning Engineers), the R-values of adobe block walls ranged from R-0.38 per inch of thickness to R-0.62 per inch. The tested Rvalues varied considerably according to the color of the material and the temperature at which the test was performed. Although there is no published R-value data specifically for cob, the values should be quite similar to those for adobe, about R-0.5. Adding straw or substituting a lightweight aggregate, such as pumice or perlite, for sand can improve cob's insulative value. Published R-values for rammed earth walls (the densest earth-building technique) range from R-0.25 per inch to R-0.4 per inch. But R-value doesn't have the final word on thermal performance. Some engineers consider R-value to be a limited and often misleading number that was created specifically to favor fiberglass. 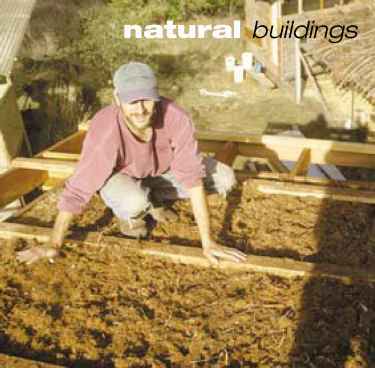 Walls made of earth and/ or straw combine some insulation with considerable thermal mass. The insulative value of a 2-foot-thick (61 cm) cob wall may be similar to a 2 by 4 stud wall with fiberglass insulation, a drywall interior, and plywood sheathing. But given the earthen material's tendency to hold onto both warmth and "coolth" over long periods of time, the actual performance of the two walls will be worlds apart. Even a relatively light, natural wall system of plastered straw bales has many times the thermal mass of a conventional wall, and this translates directly into improved thermal efficiency. cloudy weather, as indoor air temperatures drop, the mass releases stored heat to warm the interior spaces. Materials with high thermal mass can also be used as a heat sink to pull heat out of the air when temperatures are high. No matter where it is located in a building, thermal mass helps moderate interior temperatures and improves your thermal comfort throughout the year. 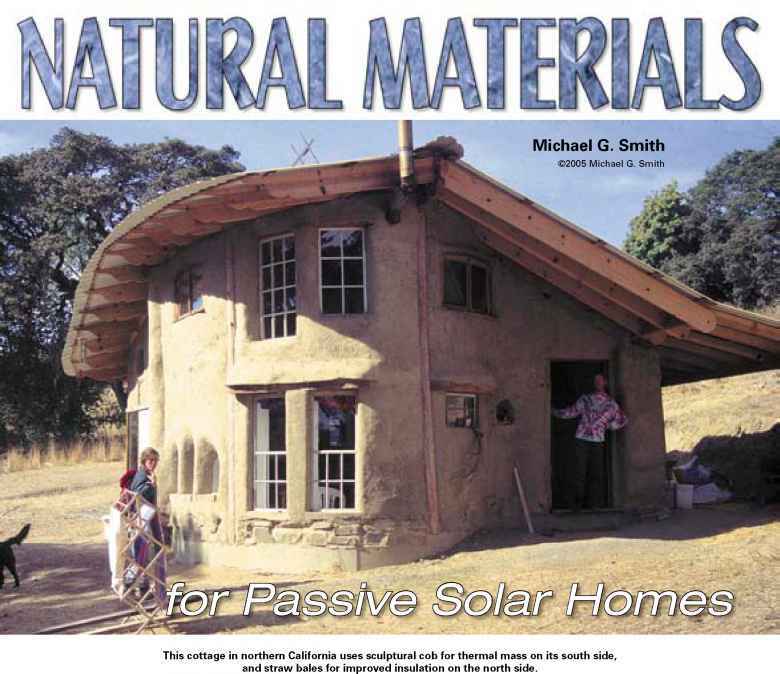 In many conventional solar houses, concrete is used as the thermal mass. Lower embodied energy alternatives include stone (with a density similar to that of concrete), rammed earth, adobe, and cob. Although cob and adobe are only about 70 percent as dense as concrete, the savings in materials cost and environmental impact balance the need to provide more volume to get the same thermal performance as concrete. For heat transfer, the surface area of thermal mass in a solar house is more important than its volume. The more surface area of thermal mass exposed to the sun, the more that heat is absorbed and stored. Within a 24-hour period, heat moves through most mass materials only to a depth of a few inches. For short-term heating and cooling, the best application of thermal mass is a fairly even, 4-inch-thick (10 cm) distribution over as many surfaces of the house as possible. Earthen plasters can easily be built up to a thickness of several inches over straw bale or light-clay walls. Straw light-clay provides about the same insulation value per inch of thickness as straw bale, and is compatible with conventional stud framing. This straw-clay house was built by Robert Laporte of EcoNest, and is awaiting exterior plaster. Adobe floors are inexpensive, beautiful, durable, and well suited for passive solar houses. 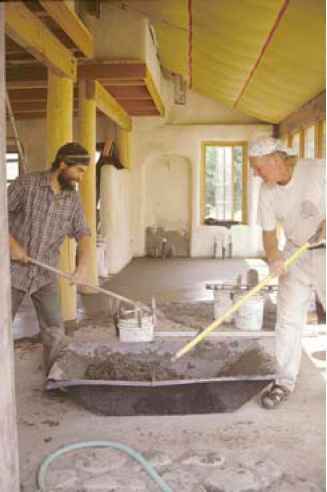 Here, a final layer of mud is being troweled on to finish the floor in a cob home in Willits, California. summer days are hot but nights are cool. In areas with mild winters, exterior earthen walls can be effective, especially on the south side of the house, where they absorb heat from the winter sun. But in most climates, thermal mass performs better if it's located inside a home, where it's protected from outside temperature swings. For maximum heating efficiency, place thermal mass where it will be struck by winter sunlight shining into the building. A sculptural cob hearth, a masonry heater, or a rocket stove within a cob bench can all serve to "collect" heat. Or you could use earthen walls for interior partitions, or build a Trombe wall, a thick masonry wall that's placed inside a bank of south-facing glass. Although Trombe walls are typically made of concrete or brick, they can easily be made of rammed earth, adobe, cob, or stone. Another highly effective location for thermal mass is in the floor. Earthen floors, whether tamped earth or "poured adobe," are typically a minimum of 4 inches thick. Several coats of linseed oil harden the floor, provide water resistance, and also turn it a dark chocolate color, which absorbs solar heat well. From an embodied energy standpoint, earthen floors are ideal if suitable materials can be found on or near the building site. Where winters are cold, be sure to provide a thermal break to prevent the ground below from pulling heat from the floor. In arid climates, using straw-clay insulation under an earthen floor may work well. In humid regions, the only viable natural insulation is pumice. 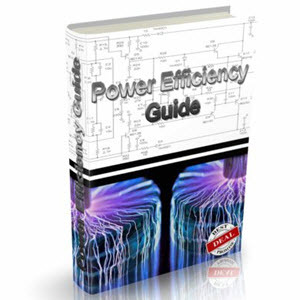 In general, the colder the climate, the more that insulation should be emphasized. 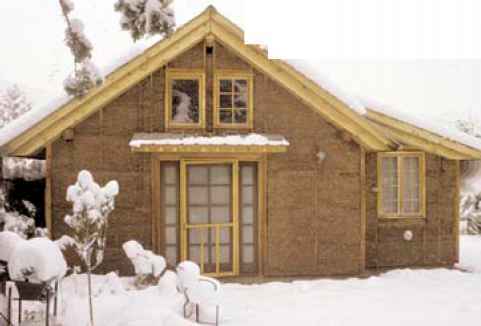 Where winters are frigid (for example, in the north-central United States, the Northeast, and most of Canada), straw bale is probably the best choice for most or all exterior walls. And don't forget to heavily insulate the roof! Keep thermal mass inside—in the floor, thick plasters, interior walls, and hearths. Less insulation is needed where winters are mild, such as along the Pacific Coast. In these regions, as well as using straw bale construction, a thinner light-clay wall might be appropriate. Mass materials like cob can be used for some exterior walls, especially on the south side of the building. Avoid building mass walls on the north side—they'll tend to leak heat out of the building in the winter. Lots of interior mass, warmed by the sun or a woodstove, can help keep the building comfortable through spells of cloudy weather. In the arid Southwest, summer days are hot, but nights are usually cool. A traditional solution is to make exterior walls from a material with high thermal mass, like adobe. Using wide roof overhangs to shade the walls and keeping windows closed during the day also limits heat gain. At night, opening windows admits the cool outside air and helps flush heat from the thermal mass. During the winter when the sun is lower in the sky, the mass walls take advantage of the sun by direct gain, soaking up the heat. Some of this heat reaches the interior, where it adds to the solar energy coming in through the windows. Another way to take advantage of thermal mass is to use the earth itself as a heat sink and temperature moderator, either by nestling your home into the earth or by piling up earth around a home's east, west, and north sides. An additional strategy for the Southwest is to use a very insulating wall, like straw bale, which slows heat gain on hot summer days and retards heat loss on cold winter nights. Lots of interior mass, such as thick plasters and earthen floors, help minimize interior temperature swings and keep the building comfortable. Perhaps the most challenging climate for a natural solar house is the hot, humid Southeast. Where summer nights stay warm, the cooling value of thermal mass is much reduced. Mass will heat up during the day, not cool down much at night, and then heat up even more the next day. The traditional solution is to build lightweight houses, raised off the ground, with lots of ventilation. Natural materials suited for this strategy include light-clay and wattle-and-daub, made from a lattice of woven sticks with a clay-and-fiber plaster smeared over it. Where air conditioning is available, insulate a home's walls and roof well, and use interior thermal mass to absorb heat during the day. Use your air conditioner at night, instead of during the hottest part of the day, to cool the mass and reduce your energy use. Not all sites are suitable for building a natural solar home. Walls of earth and straw are vulnerable to water damage and should not be built where flooding is likely. And heating with the sun can be difficult or impossible on steep, north-facing sites and sites heavily shaded by trees or tall buildings. However, in most locations, passive solar strategies can be combined with local, natural materials to create some of the most sustainable, energy efficient, and beautiful housing you can imagine. With the prices of energy and manufactured materials on the rise, and environmental health and indoor air quality on the decline, does it make sense to build any other way?